There was a time when being a nerd was not fashionable. Nowadays, the contrary seems to be true: You see nerds and geeks —which are overlapping behavioral categories— in positions of power and influence everywhere. Latest story I heard is that Nobel price-winner and world famous columnist Paul Krugman is a Science Fiction aficionado who wrote the prologue to a deluxe edition of Isaac Asimov's Foundation series. Many of the movie directors who make Hollywood big money —Joss Whedon, Guillermo del Toro, etc.— are part of our tribe of social misfits, as well. Side note: Years ago I ran into del Toro in a comic book store in Madrid. His plastic bag was fuller and much larger than mine. Wikipedia defines "nerds" as "overly intellectual, obsessive, or socially impaired (people). They may spend inordinate amounts of time on unpopular, obscure, or non-mainstream activities, which are generally either highly technical or relating to topics of fiction or fantasy, to the exclusion of more mainstream activities. Additionally, many nerds are described as being shy, quirky, and unattractive, and may have difficulty participating in, or even following, sports." That's me. Perhaps that was me a bit more when I was a teenager than it is today, as my social skills have improved, and my interests have expanded a bit, or so I hope. But I still keep tastes developed in that age. I was a textbook nerd, I assure you. Comic books? Check. Science Fiction? Check. Hard rock and Metal (in their mildest forms, I admit)? Check. Computers? Check. Role-playing games, wargames, card games? Check, check, and check. Oh, and long hair. Sorry, I'm not sharing pictures. The Functional Art is not my first book. 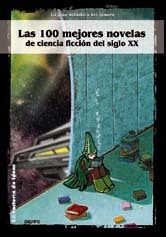 My first commercially published book, co-authored with a group of friends, is titled The Best 100 Science Fiction Novels of the Twentieth Century, and it still can be purchased in Spain. The cover is at the beginning of this post. For that book, I reviewed more than 20 novels by Robert Silverberg, J.G. Ballard, Arthur C. Clarke, Brian Aldiss, and others. See the complete list of novels (in Spanish) here. Yep, I was almost a scholar. So to speak. I wrote the prologue to the Spanish edition of A Storm of Swords, the third installment of George R.R. Martin's now hugely popular fantasy saga, A Song of Ice and Fire (renamed by HBO: Game of Thrones.) The prologue is available online here (scroll down.) If you don't understand Spanish, run it through Google Translate. If you ever go to Spain and can get your hands on a copy of this book, go to its first few pages and you'll see my name in there. A while ago, my friend Andy Bechtel, a professor at UNC-Chapel Hill, wrote a very nice post about how Dungeons&Dragons improved his vocabulary. I would go beyond that. I learned English thanks —in part, at least— to Dungeons&Dragons (and other games). Many manuals had not been translated to Spanish when they started to become popular. Also, I believe that traditional role-playing games, those played around a table, and consisting of collaboratively imagining worlds and building narratives, improve your storytelling skills. Finally, I played a lot of strategy board games. Not the family games you see in Barnes&Noble these days (Settlers of Catan, for instance, which is a fine game, although a bit too simplistic for my taste), but the ultra-complex kind. Third Reich, to give you just an example. Or Empires in Arms, a simulation of the Napoleonic Wars in which it could take three hours to complete a single turn (and months to finish the whole game.) I learned a lot of Geography and History thanks to those things. Each game played led to books that could put it in historical context.